On Saturday I attended #BloggersFestival, an annual event organised by full-time blogger, extraordinaire Scarlett London. 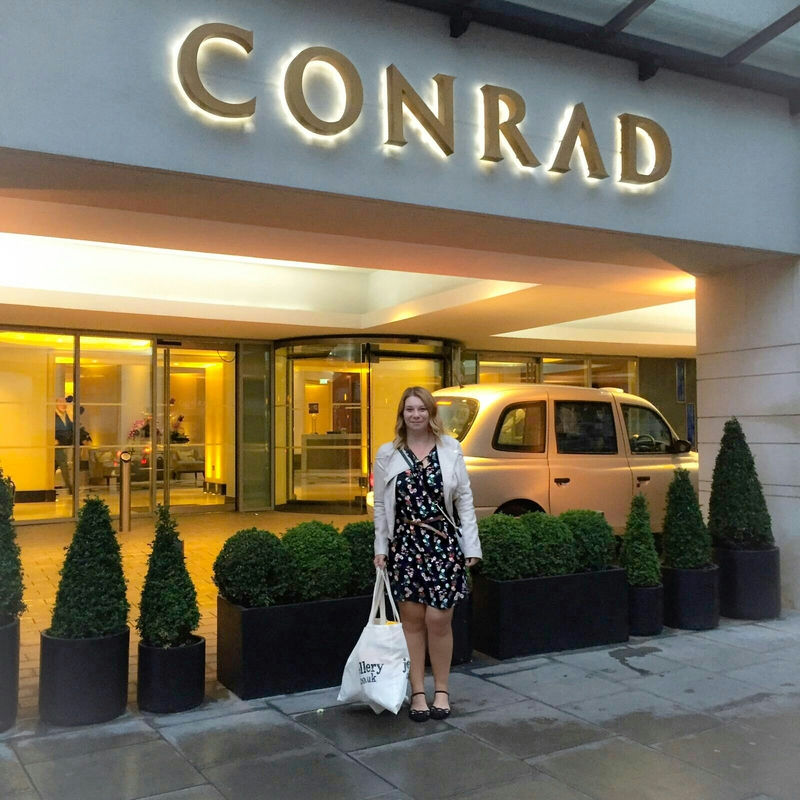 The event was held at the Conrad St James Hotel located in St James’ Park and was the perfect opportunity for blogger newbies such as myself to meet fellow bloggers and brands. Down the spiral staircase, bloggers were welcomed with a complimentary cocktail reception with a photographer on hand taking pictures of those arriving at the event against a white-flowered backdrop. 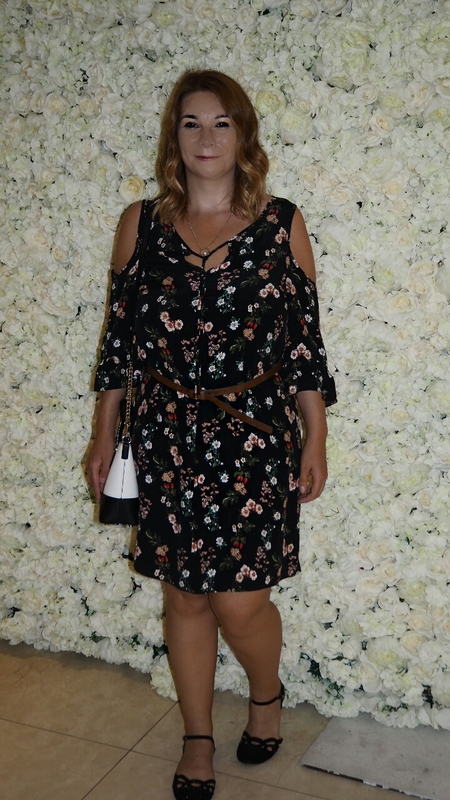 The flower wall, designed by Dress It Yourself was stunning with many, including myself, making the most of the unique background to capture a few pictures before entering. Made In Chelsea’s Jamie Laing’s candy store company Candy Kittens had their own pick n mix stand in the reception area to give bloggers a sugar kick whilst browsing the brands and one of my regrets was that I didn’t tuck in soon enough as they had been devoured upon my return! This was my second event, having only recently attended the #MKBloggers brunch in my local area, therefore I wasn’t sure what to expect. This event is literally like being a kid in a candy store for new bloggers with hundreds of bloggers travelling far and wide to socialise and share tips with an abundance of brands including Friction Free Shaving who had a Craig David vibe going on with their packaging (can’t wait to try their razors) and family run David Hampton, a luxury leather goods company showcasing their products. The brands had varying products from postal services such as Go Send, which enables you to shop tax-free in the United States to Alflorex an anti-inflammatory prevention for IBS. Essential blogger products such as pocket size portable phone chargers from PNY and VARTA samples were given out (I choose bronze gold and mint green colours) and are ideal to keep you up-to-date with your social media by keeping your phone fully charged when you’re on the go and I can’t wait to use mine. Other brands at the events included Body Chef with some of their personalised diet meal-plans and I can verify their chocolate brownie is delicious and was just what I needed after my nightmare of a train journey home to Milton Keynes. 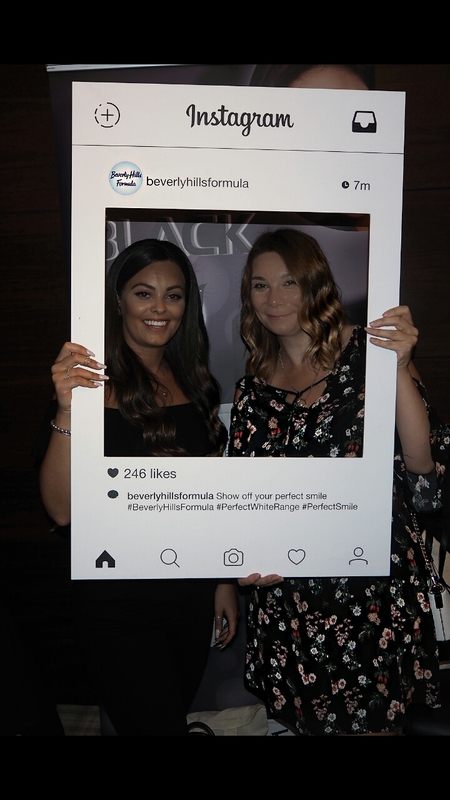 Beverley Hills Formula with their popular advanced tooth-whitening formula, which as you can see from the photo below I didn’t dare do a toothy smile stood next to my friend Nikki who has very white teeth indeed! Having obtained two samples of their whitening toothpaste I hope to be able to flash off my dazzling Hollywood smile at next year’s event..! The Jewellery Box stand was adorable, decorated with fairy lights and flowers with Gemma from Jewellery Box taking the time to talk to me about the brand, which sells 9ct jewellery pieces for affordable prices. The jewellery on the stand was for display purchases only, therefore I wasn’t able to purchase their ‘love’ lettered necklace but will be sure to purchase some pieces off the website soon. Jewellery Box also had a photoshoot, which many of the bloggers enjoyed. A brand I was really excited about, Lipivir prevents outbreaks of coldsores from arising and being a coldsore sufferer myself, I was curious to try the lip solution. The gentlemen on the stall kindly gave me a number of samples to take home with me. If like me and you’ve tried every product under the sun to treat your coldsores, it may be worth giving Lipivir a go. I also can’t wait to try my beauty samples from Exuviance tailored to assist my oily t-zone, something I wrote about in my recent Clarins Treatment post. Skincare masks were provided by My 7th Heaven, which gives me more of a reason to have a girly pamper day with a facemask and using my hair oil sample from Natural World, which contains 95% of natural ingredients to nourish your hair. As you can see from the picture below, I could barely carry all my product samples from the event and I would like to say a huge thank you to all of the brands attending #BloggersFestival. I certainly have plenty of products to blog about in the coming weeks. For those of you who are also new to blogging or haven’t yet had the courage to attend an event, you needn’t worry as all the bloggers at the event were lovely and very approachable. I can’t wait to read other blogs about the event to hear if others enjoyed it as much as I did so if you attended I’d love to hear from you. 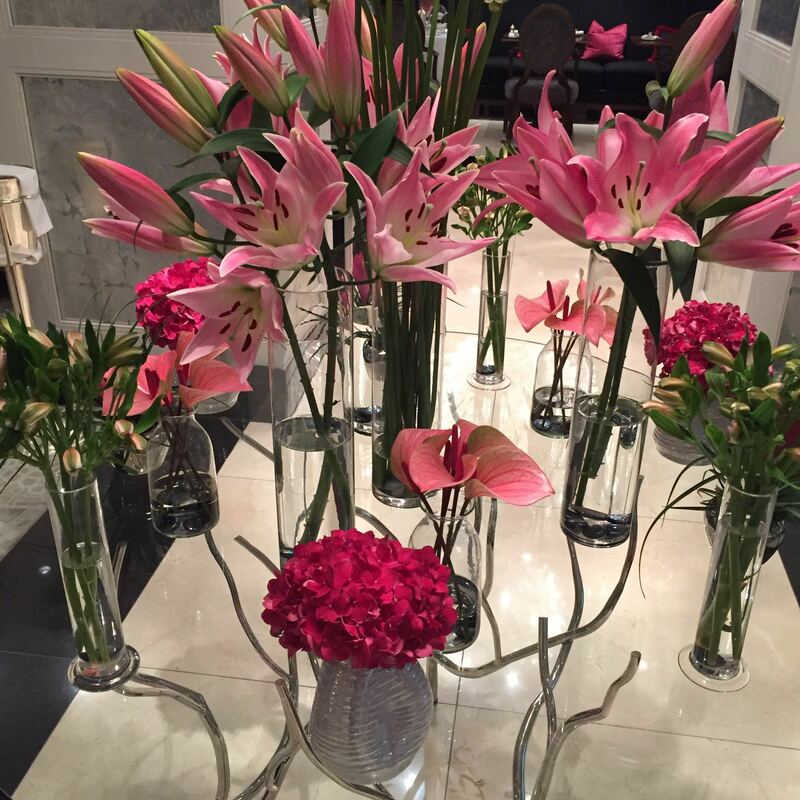 Of course, none of this would have been possible without all the arranging and planning of the event undertaken by Scarlett London and I can’t wait to attend the next one! Be sure to follow Scarlett on Twitter or check her SL Events website to keep up to date with future events.